KODAK INDUSTREX High-Speed HS800 Film is Carestream Health’s most versatile fi lm for non-destructive testing. Now you can use one fi lm for any exposure method, whether it’s direct x-rays, lead screen, fl uorescent screen, or fl uorometallic screen. Combined with KODAK LANEX Fast Screens, HS800 Film offers more speed than any fi lm-screen combination available today. HS800 Film offers high speed and high contrast with Carestream Health’s T-GRAIN Emulsion technology. This medium-grain film can be processed in automatic processing chemicals in the short 5-minute cycle, or manually in a 2-minute cycle. With a cold image tone and high gloss fi nish, you get the image you need, whatever the conditions you’re working under. HS800 Film can be processed manually or automatically in a range of processing cycles using KODAK INDUSTREX Single Part Developer Replenisher and KODAK INDUSTREX LO Fixer and Replenisher. 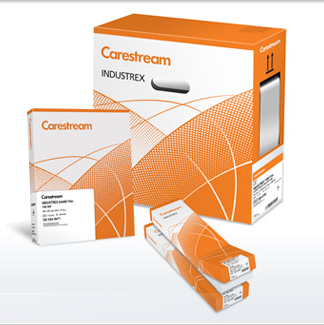 For additional information on automatic processing, see Carestream Health publication TI-2621, Processing KODAK INDUSTREX Films. For additional information on manual processing, see Carestream Health publication TI-2643, Guide to Manual Processing of KODAK INDUSTREX Films. Notice: Observe precautionary information on product labels and Material Safety Data Sheets. 1 HS800 Film with Rennex screen assigned a relative exposure of 1.